Renowned for Bluff Oysters, Bluff is located at the bottom of the South Island, New Zealand. Just a twenty minute drive from Invercargill, the seaside town is the oldest permanent European settlement in the country and is home to nearly 2000 residents. Bluff Harbour is the terminus for the ferry across Foveaux Strait to Stewart Island/Rakiura National Park and is the main gateway for New Zealand ships heading to Antarctica. The Port of Bluff has been operating since 1877 and nowadays South Port Ltd handles over 2.5 million tonnes of import and export cargo in a normal trading year. 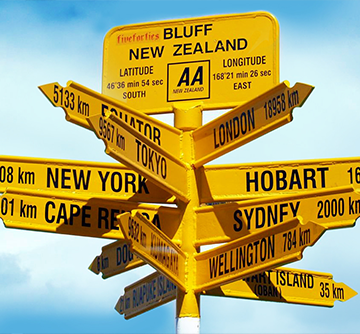 The famous signpost at Stirling Point in Bluff marks the beginning of State Highway 1, which spans the length of the country. Bluff Hill’s walks and lookouts attract visitors from afar and New Zealand’s only aluminium smelter can be found at nearby at Tiwai Point. For more information on Bluff, its history, visitor attractions and events visit www.bluff.co.nz or check out the world famous Bluff Oyster and Southland Seafood Festival.